The Moon Still Beckons, But Does Anyone Care? 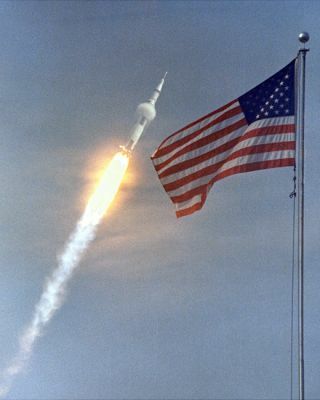 Here?s aquestion: If Apollo 11 were happening right now, how long would we payattention? Forty years ago, the TV networks - all three of them -followed everyphase of the mission. On July 20, 1969 they went on the air with 30 straighthours of uninterrupted coverage of Neil Armstrong and Buzz Aldrin?s ?giantleap for mankind.? For a13-year-old space nut like me, it was nirvana: I spent most of that 30 hoursparked in front of the TV with my maps of the moon, models of the spacecraft,and articles about the mission, my own little ?mission control? in the den. ButI had the sense that the whole country, even the world, was sharing theexcitement of witnessing aturning point in human history. Thatfeeling didn't last long. In November 1969, on the day after Apollo 12astronauts Pete Conrad and Alan Bean made their own lunar touchdown, the NewYork Times ran a story entitled, ?Second Moon Visit Stirs Less PublicExcitement.? In thearticle, one of the quotes from man-on-the-street interviews around the countrybrought home just how fickle Americans can be: ?It?s old hat; it?s not like thefirst time.? Looking at that clipping now, I can hardly believe it: You werealready bored?! And that trend continued even as the Apollo missions got moreambitious, and the live TV pictures from the lunar surface got better andbetter with each new landing. By the time of the finalApollo moonwalks, on the Apollo 17 mission in December 1972, the networksno longer covered the moonwalks in their entirety. We had already stoppedwatching. Today, weare submerged in a 24/7 onslaught of information in which everything isinterrupted by something else, when ?breaking news? banners fill our screenswith mind-scrambling frequency. In the midst of this deluge, would even thewords ?live from the moon? be able to rise above the noise for very long? I?mnot so sure. In any case,I?m much more aware of how strange it feels to look back at Apollo from wherewe are today. Who would have predicted that in 2009 we would have to go back 40years to find the mostfuturistic thing humans have ever done? Apollo 17 commander Gene Cernan hassaid that it is as if John Kennedy reached into the 21st century, grabbed adecade of time, and spliced it neatly into the 1960s and 70s. Ever since then,I?ve been waiting to see us get back to where we were in 1972. Now, in themidst of the real 21st century, none of us can say when humans will go back tothe moon - or what language they will speak when they get there. If Chinesetaikonauts become the next lunar explorers, will we be spurred to action, orshrug it off? Or will we have somehow risen above our differences and found away to go back to the moon together? Call mena?ve, call me just another aging Baby Boomer who can?t let go of the past. ButI firmly believe that Apollo was just the first chapter in a story ofexploration that has no end, and will continue as long as humans are alive. AndI still want to believe that when humans do return to the moon to follow in theApollo astronauts? lunar footsteps, it will have more of an impact than manypeople now realize.? At lastwe?ll be able to leave behind the cacophony of our TVs, cell phones, andBlackberrys and stand in stillness under a clear night sky, looking up at themoon and knowing that we are seeing humanity?sfarthest outpost. We?ll gaze on that bright neighbor world and know thatpeople are living and working there, seeing what no one has ever seen anddiscovering what no one has ever known, and solving the enormous challenges ofmaking us a truly spacefaring species. And we?ll wonder what took us so long. Fortyyears after astronauts first set foot on the moon, SPACE.com examines what we?vedone since and whether America has the right stuff to get back to the moon by2020 and reach beyond. For exclusive interviews and analysis, visit SPACE.comdaily through July 20, the anniversary of the historic landing.